I posted a similar thread in the Nature and Wildlife forum a week ago and a few people thought it was interesting, so I figured why not post it here to see what you think of it. 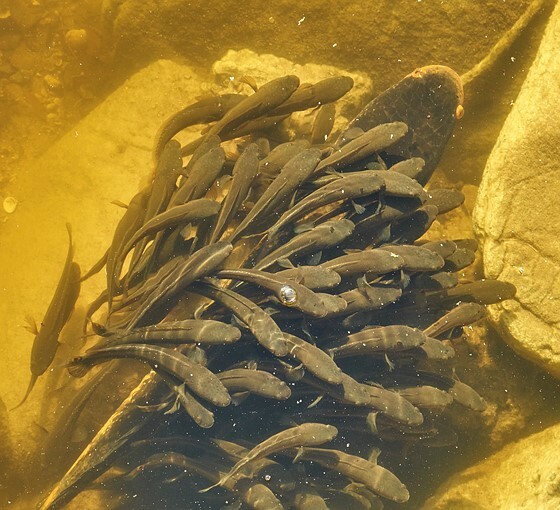 I shot two pictures of an Asian Snakehead and her babies last week in one of my local lakes. 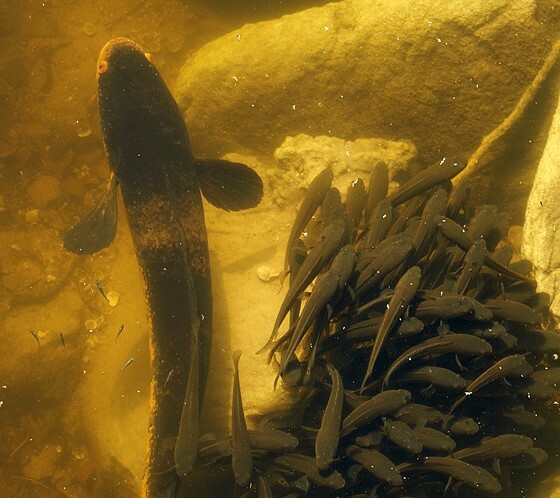 They are not native to the USA and are eating fish that is in our local lakes. They are like the great white sharks in fresh water down here and can eat every other fish they come across. When they bread, they have around 50 babies that the parents guard until they get big enough to fend for themselves. The only inhabit fresh water lakes and canals within about 50 miles from where I live so far, thank goodness. The only problem is that there is nothing that can stop these fish from breeding, and they are killing off a LOT of the local fish. The parents seem to guard them until the fan fend for themselves. I have caught about 60 of them and ate about 50 of them, they are the best eating fish I have ever caught. The also give the best fight of any fish in either salt of fresh water. I invited this one to dinner, a before picture. 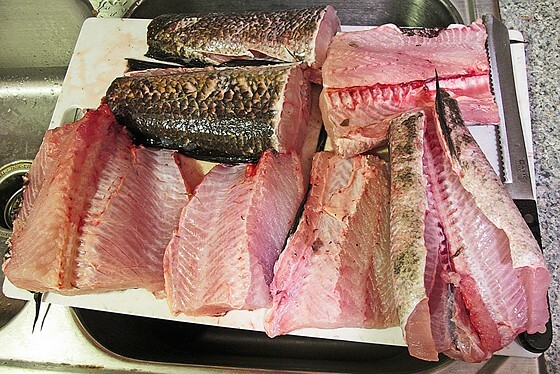 They have some of the best eating, white, fluffy, moist meat of any fish. They are the best fish I have ever eaten, and they fight better than any fish I've ever caught. 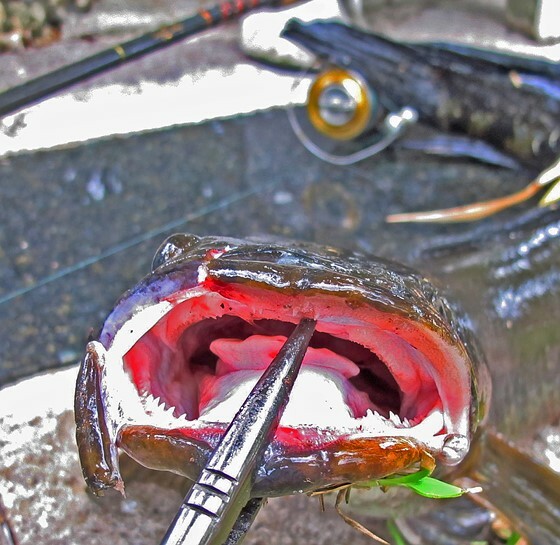 This is the only picture I have of the Asian Snakehead fish teeth, but it shows how they are able shake their heads and rip fish apart. It has another row of the same size teeth on the top jaw that seem to fold down when it grabs a fish. If you look at the fishing reel in the background, it will give you an idea of how big this fish is. That fish was about 34 inches long, and it tasted great! 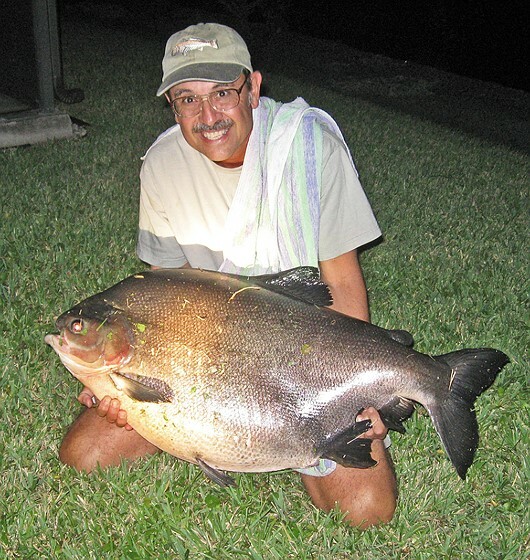 I also caught the World Record Pacu, right here in South Florida in a lake about 15 minutes from my house. 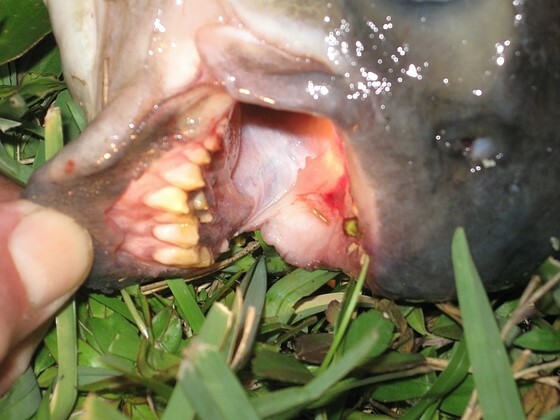 The Pacu is a cousin of the piranha of South America, an invasive fish now found in South Florida. Yep, that's me holding this 55 pound fish. I was fishing just after dark with 3 friends in 1 of my friends back yard having a BBQ and beers. The Pacu took my bait and slowly started taking drag, I tightened the drag and the fight was on. After over 15 minutes of fighting the fish, I finally got it to shore, and it broke the net we tried to get it in with. Then, all 3 of my friends got into the water and grabbed it to pull it up into the yard. If I did not have 30 pound test fishing line, 25 pound leader, and a good heavy duty hook, I would never have been able to pull it in. It was quite a fight! Those are the teeth they use to crack nuts and berries that fall into the water. They are also the teeth that crush the nuts of fishermen in south America. It had teeth on the upper jaw too, but my friend did not want to risk his finger being taken off. I did not blame him. Well, I hope this did not offend anyone, but I wanted you all to see exactly what kind of crazy wildlife we have down here in South Florida. Not my normal wildlife typle post, but something different for a change. As alway, any comments or questions are always welcome. Life is too short, so make the best of it while you can!